Many in the church think that our final destiny is heaven. It seems like that’s what Jesus promised when He said, “if I go and prepare a place for you, I will come back and receive you to Myself, that where I am, you may be also” (John 14:3). But that is not the end of the story, because in Revelation, John declares that the place Jesus is preparing will ultimately come “down out of the new heaven from God to the new earth ” (Rev. 21:2) Scripture doesn’t conclude with God’s children floating on clouds up there, but with God living with His saints down on a new earth. 1. The home of God on earth. David sings “praises to the Lord, who dwells in Zion” (Ps. 9:11a). Asaph calls on God to remember “Mount Zion, where you have lived” (Ps. 74:2c) and God Himself concludes the prophecy of Joel with the cheer, “The LORD dwells in Zion!” (Joel 3:21). 2. The place where God will defeat the powers of evil. Zechariah prophesies that God will destroy all of His enemies at a climactic battle in Jerusalem (Zech. 12:1–9; 14:12–15). Joel prophesies “Blow the ram’s horn in Zion, sound the alarm on My holy mountain! 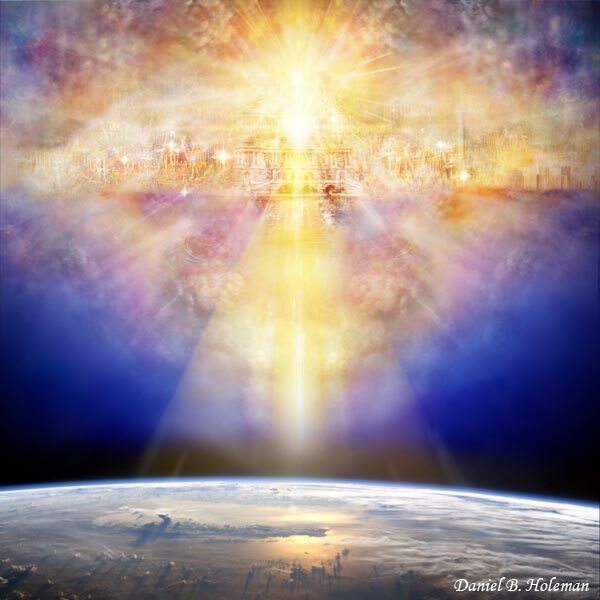 All the inhabitants of the earth will tremble, because the day of the Lord has come, because it is near” (Joel 2:1). Amos adds, “The LORD roars from Zion and utters His voice from Jerusalem” (Amos 1:2a). Isaiah declares that “the Lord of Hosts (shall) come down to fight for Mount Zion, and for its hill” (Isa. 31:4c). 3. The source of blessing for the world. Psalm 46:4 states, “There is a river whose streams make glad the city of God, the holy dwelling place of the Most High.” Ezekiel 47 adds that this river, which begins in the temple, runs from Jerusalem all the way to the sea. The sea then carries its new fertile, fresh water to the ends of the earth. He writes: “By the river upon its bank, on this side and on that side, shall grow all kinds of trees for food, whose leaf shall not fade nor shall its fruit fail. They shall bring forth fruit according to their months, because their water issues out of the sanctuary. And their fruit shall be for food and their leaves for medicine” (Ezek. 47:12). All of the O.T. prophets were shown Jerusalem would eventually be restored. Even before the carnage began, Isaiah announced that God would keep His promise. “Good news” would eventually come to Jerusalem, for “the glory of the LORD will be revealed” there—in a way that no one would expect (Isa. 40:1-11). God’s glory was revealed when the Son of God came to earth. Jesus recognised the importance of Jerusalem, and He was “steadfastly set to go to Jerusalem” (Luke 9:51). There, He defeated the powers of evil before the dwelling place of God. His death provided life-giving water for the world. John records Jesus saying, “He who believes in me, … out of his heart shall flow rivers of living water.” John then explains, “By this He spoke of the Spirit, whom those who believe in him would receive” (John 7:38-39). The Spirit came to Jerusalem on Pentecost, where the life-giving water of the gospel bubbled up, streamed into Samaria and finally poured “to the ends of the earth” (Acts 1:8). Those who are washed will join Jesus when He brings His new Jerusalem to the new earth. God is with us. John writes, “And I heard a loud voice from heaven, saying, “Look! The tabernacle of God is with men, and He will dwell with them. They shall be His people, and God Himself will be with them and be their God” (Rev. 21:3). Three times in this verse, John says that God will live with His people. The biblical story doesn’t end with God taking us up to live with him, but with God coming down to live with us. He is Immanuel, which means “God with us” (Matt. 1:23). Evil has been vanquished forever. Jesus will return and “wipe every tear” from our eyes. “Neither shall there be any more sorrow nor crying nor pain, for the former things have passed away” (Rev. 21:4b). This perfect bliss will continue forever, for “No unclean thing shall ever enter” the new Jerusalem (Rev. 21:27). The entire world flourishes under the blessing of God. In spectacular fulfilment of Ezekiel’s vision, John declares that a river of life will flow “from the throne of God and of the Lamb in the middle of its street” (Rev. 22:1b-2a). Its waters will nourish the tree of life, which bears monthly fruit, and leaves that heal the nations. Every nation bears the scars of their bloody attempts to achieve peace and prosperity. Their wars will continue until the end, when Jesus brings His kingdom of peace to earth and reigns over our world from the new Jerusalem. John closes his letter, and the entire Bible, with the only appropriate response: “Amen. Even so, come Lord Jesus!” (Rev. 22:20b).